Merry Christmas to one and all! After today my kids are officially on holiday break. They can't wait. Greetings to Nervisa and Amin. Elma, I have lots of favorite books, but at this time of the year I do like Santa Claus Doesn't Mop Floors and Mrs. Jeepers Creepy Christmas. Johnny and Adem, I love the playground in Elves Don't Wear Hardhats. Courtney, Alena, and Emily-I'm so glad you got the book. Lani, have you asked your teacher for help with math? Or maybe your parents or an older brother or sister? Jessie and Izhar, my newest book is Mrs. Jeepers Creepy Christmas. Kevin, I bet your teacher wishes you could listen. Kevin, Adina, Myleana, Christopher, Semir, Mary Ann, Bakang, Loan, Phuong, and David- I'm so glad you liked Leprechauns Don't Play Basketball. 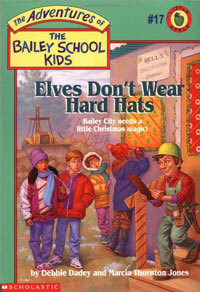 Did you know another elf named Eli makes a return visit to Bailey City in Mrs. Claus Doesn't Climb Telephone Poles? Sidra, I have three pets. You can see their picture on the About Me section. Lohnhinh, if I see an elf I will let you know. Priscilla, whenever I make a title I always brainstorm and write down everything I can think of-then I take those ideas and pick the one I like the best or sometimes combine different ones. Urooj, I think it is fun to write because I can make anything happen in a story. Julie, the don't part of my titles actually came from something Liza said in one of my books. Did you guys get an ice storm? We did, but it wasn't too bad. It was actually quite pretty. Ice coated the trees and each little blade of grass even had it's own ice coat. I started a new book this morning about a snow monster, so the weather fit right in. I can look out my office window, see the ice and get inspired. Thanks to Diandre, Joong Ho, and Josie for their guesses about what might be in the box in Mrs. Jeeper's basement. The winners were announced today. Should I ever tell the answer or should I let people find out for themselves by reading the book? Kevin!, Egypt is a interesting place. I went there about eight years ago to visit a school in Cairo. My oldest son went with me and we saw the Great Pyramids and even went on two trips on the NIle River. It was one of the most exciting trips I've ever had. The school I visited, The Cairo American College, was amazing and the people were wonderful. By the way, you might enjoy Mummies Don't Coach Softball. Greetings to Jenelle, Amina, and Mr. Cazier's class! I hope you like Genies Don't Ride Bicycles (my mom's favorite.) My first book came out in 1990, so I'll let you do the math to see how long I've been writing. (Oh yes, I used to be a teacher too!) My favorite book is usually the one I'm working on right now, but The Worst Name in Third Grade is definitely one of my favorites, along with Mrs. Jeepers Creepy Christmas. Which, I'm sorry to say I don't even have yet! I can't wait to get my copies, so Phillip and Erick may get theirs before I do. Lizz, I'm from Kentucky. Brenton, that's so cool that you are doing lots of writing. There are contests for kids who are writers that you might consider, as well as magazines that publish kids stories. Sometimes it's a bit easier to have success there than starting with book publishing. I'm told getting a script looked at is even harder than getting a book published! But like my dad told me one time, if other people can do it-then so can you. So good luck to you and Author-to-be. I think one of the books that I had the most fun writing was The Slime Wars because I wrote it with my son, Nathan. It's snowing here in Pennsylvania! How's the weather down under Brenton? I'm sorry to say my editor doesn't seem interested in Bailey Journals, although Marcia and I loved the ideas. I agree with you and lkechi that it would be cool to have a BSK movie. Yes, you are correct that 1 page equals 1 minute in a screenplay if you are using Courier 12 point for your font (that's what all screenwriters use). I think the book that I dedicated to you is Vampires Do Hunt Marshmallow Bunnies which comes out in March. I'll look forward to your package. Joshua, my newest book is Mrs. Jeepers Creepy Christmas. There's even a contest for it on my homepage. Kasey, Haley, River, Amanda, Azilywsa, Mora, Brittany, and Sarah had great guesses. Hurry to guess, the contest ends next Wednesday! Did you have a great Thanksgiving vacation? I did. My oldest son and his friends, mom, brother, sister-in-law, nephew and his wife all came to visit. There was lots of laughing and eating. We went shopping and visited Valley Forge. I went in the house that George and Martha Washington stayed in that winter. I saw huts like the soldier's stayed in. It was kind of neat to think that George and Martha walked up the same steps that I did. Mark, Tim, and Joe-I'm so glad you like the Bailey City Monsters. Have you read all 10 of them? I'm sorry to say there are no plans to write any more, but I must admit I did like Kilmer and his family. Kevin! !, I'm so glad you ordered Mrs. Jeepers Creepy Christmas. I hope you'll like it. If anyone hasn't guessed what's in the box in Mrs. Jeepers basement, don't wait. You can guess by going to Kid's Talk . If you guess right, you're a very good guesser If you guess wrong, sorry-you get slimed! Speaking of guesses. Good job: Dylan, Lucas, Cosmo, Vishnu345, Nicole, Makayla, and Courtney! 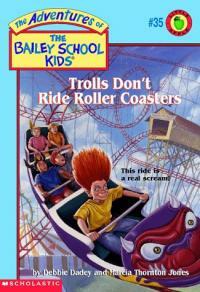 Yes, Elizabeth you guessed it-the next Bailey School Kids book is Mrs. Jeepers Creepy Christmas. Makayla, Bowie was a fun school to go to. It was so nice to meet you. Courtney, I'm afraid I'm all full up for school visits for the rest of this school year. But tell your teacher I'd love to visit next year. I'm glad you liked Dragons Do Eat Homework. The next chapter book will come out at Easter time. It's called, Vampires Do Hunt Marshmallow Bunnies. Abby, good luck on your project about me. If you need help, go to the Swamp Club . There's a whole section to help you. Wow! Maria, Katie, Gracian, and David-thanks for the awesome ideas! Howdy to Cole. Kevin, you can usually check an author's website for how to get in touch with them. Thanks for the fun idea Amelie and thanks to Kasey for the suggestion of visitng schools. Actually, I am visiting quite a few schools in 2008. It'll be fun. Tkeijah, you can look on the Swamp Club page for stuff about me for your book report, there's even a book report form to help you out. Hi to Alex (who I have a sneaking feeling I might know personally). Tia, Avery, Leslie, Kasey, and Haley-you guys rock! Kayla, Kim, Aladrian, and Kevin!! had good guesses (Kevin, I got a laugh out of your suggestion). I'll let you know if you're right after Christmas. Of course, if you can't wait you can read Mrs. Jeepers Creepy Christmas, but don't tell anyone the answer!